Engines: Two Pratt & Whitney Wasp S1H1-G, 550 hp, 9-cylinder radial engines. By Stephen Sherman, Apr. 2007. Updated July 23, 2011. Looking at old airplanes, they seem incredibly archaic --- with two wings, made of wood and cloth, open cockpits, struts and wires all over. 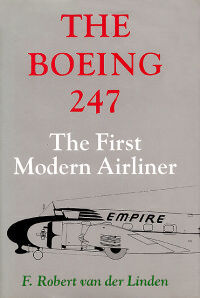 But the 1933 Boeing Model 247 suddenly resembles modern aircraft. Not that I would expect to jump into such a machine if it pulled up to the gate at LaGuardia, but the 247 is recognizably modern. While the Douglas DC-1 set the stage for the DC-3 to become the most widely used airliner of the Forties, the prototype of Boeing's 247 flew on February 8, 1933, five months before the DC-1. An all-metal, twin-engined, low-winged monoplane, the Model 247 was powered by two 550-horsepower Pratt & Whitney Wasp radial engines. and with retractable landing gear as well, it showed aerodynamic qualities. Lightweight alloys reduced its weight. It could fly over 180 MPH, it could climb on one engine with a full load, and it was also the first airliner to use wing flaps. Its final version, the 247D, had variable-pitch propellers and improved performance at higher altitudes to compete with the Douglas DC-2. It had room for 10 passengers, two pilots, and a stewardess, plus mail and baggage. Only 75 were ever built. As 1930 approached aircraft designers were getting away from wooden biplanes, turning to all-metal monoplanes. Boeing Aircraft Company pioneered metal aircraft, using welded steel tubes in the fuselage frame, the prevalent technology until superseded by monocoque sheet metal structures in the next decade. Boeing's first all-metal monoplane was the Monomail, a cargo and mail aircraft, introduced in May 1930. The Monomail had a sleek, aerodynamic low-wing design, cantilever construction, retractable landing gear, a streamlined fuselage, and an engine covered by a cowling. Only one Monomail Model 200 was built; it was later modified for long-distance passenger service as Model 221A. The Monomail's design was too advanced for the engines and propellers that were available in 1930. The airplane required a low-pitch propeller for takeoff and climb and a high-pitch propeller to cruise. By the time the variable-pitch propeller and more powerful engines were available, newer, multiengine planes replaced it. The Monomail inspired the B-9 bomber, the U.S. Air Corps' first all-metal monoplane bomber, which first flew in April 1931. The two-engine plane could make 186 MPH, had semi-retractable landing gear and metal construction. While the B-9 never progressed beyond prototype, it also influenced the Boeing 247. Three key men — President Phillip G. Johnson, Vice President Claire Egtvedt, and Chief Engineer C. N. Monteith — chose to develop the transport potential of the Boeing B-9 twin-engine bomber. Their development of the 247 was difficult and full of disagreements. Boeing's chief engineer R.J. Minshall wanted a plane no larger than the planes in current production, citing pilots' preferences and the expense of larger hangars. Fred Rentschler of Pratt & Whitney and Igor Sikorsky (both members of United's parent corporation), favored a larger plane that would offer more comfort to passengers on long flights. The small plane advocates prevailed, and the 247 only seated ten passengers and a wing spar protruded across the cabin aisle. In spite of the added weight, a co-pilot was added, in the interest of safety and comfort. In another bit of foresight, the design accommodated a (larger) variable-pitch prop, even though the prototype was fitted with an ordinary fixed-pitch propeller. In the later model 247D, the variable-pitch prop was included. The first 247 flew on February 8, 1933, a year later than planned. It went into service with United on March 30, and most of the first 25 planes were delivered during April and May. The twin-engine Boeing 247 made the common Ford and Fokker trimotor airplanes obsolete and gave an enormous boost to the U.S. airline industry. United Air Lines purchased 60 of the planes; the remaining 15 went to other customers including Roscoe Turner, Clyde Pangborn, and Lufthansa. Many great aircraft built between the wars participated in air races; such contests were also excellent proving grounds for new or established production types. So, when the MacRobertson Race from England to Australia was organized in 1934, a Boeing Model 247D was entered. 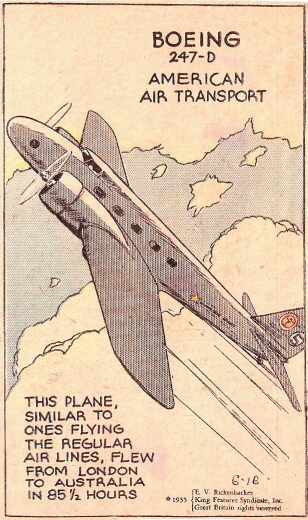 Flown by Col. Roscoe Turner and Clyde Pangborn, it gained second place in the transport section, behind its great rival the DC-2. When the plane's rollout finally occurred, some 15,000 visitors came to see it. The passenger cabin had soundproofing, a lavatory (although no mirror or running water), individual air vents and reading lights, and heating and cooling that were thermostatically controlled. Its navigation instruments included an autopilot and two-way radio. On display at the 1933 Chicago World's Fair, it was estimated that 61 million people viewed it. The success of the plane provided a response to the aerial feat of Italy's air minister, General Italo Balbo, who had just led a fleet of 24 Savoia-Marchetti flying boats across the Atlantic Ocean from Rome to Chicago. On June 12, 1933, the 247 made its first transcontinental commercial flight, flying from Newark to San Francisco in only 21 hours. On its return flight, it shaved another hour off that time. Imagine! Flying from coast to coast in just under 20 hours. United Air lines had great success with its sixty planes for the relatively short time that it flew them. Many of United's aircraft were later purchased by Western Airlines. On October 10, 1933, a United Airlines Boeing 247 was the victim of the first proven case of sabotage of a commercial airliner. The aircraft, en route from Cleveland to Chicago, was destroyed by a nitroglycerin-based explosive device over Chesterton, Indiana. One 247D went to China, purchased by young warlord Chang Hsueh-liang, called the “Young Marshal,” where it played a key role in a remarkable incident of the Sino-Japanese War. Called Bai-Ying or “White Eagle,” it brought about a suspension of the civil war and allowed the Red and Nationalist armies to join forces against Japan. In 1935, Chang bought the stock Boeing as his personal transport. Chang Hsueh-liang, while an autonomous warlord, had been staunchly anti-Japanese and anti-Communist. When the Japanese (with Chiang Kai-shek's connivance) drove his Tungpei Army out of its home area, Manchuria, in 1935 it was seriously weakened. Next, he encountered Mao's Red army and was captured. To Chang's surprise, the Communists did not massacre their many prisoners. Instead, the Manchurian troops were given a short but intense, anti-Japanese indoctrination and sent back to their units. Deeply impressed, Chang immediately flew in his Boeing 247 to the Red capital in Yenan and signed an immediate secret truce. Then, when Chiang Kai-shek came to the Young Marshal headquarters in Sian, Chang Hsueh-liang’s bodyguard invested Chiang Kai-shek’s quarters and arrested the Generalissimo. Within hours, army units across China declared for the mutineers. Chang dispatched his Boeing to fetch the Communists from Yenan and other warlords. The Reds proposed Chiang Kai-shek call a truce to the civil war and that all factions wage immediate war on Japan under his leadership. As part of the deal, Chiang Kai-shek was released, and he kept his promise. But he never forgave Chang Hsueh-liang. When the honorable Young Marshal flew to Nanking in his Boeing and surrendered to Chiang by way of apology for his conduct at Sian, the Generalissimo had him imprisoned. The KMT even took him with them when they fled to Taiwan, where he remained in prison well into the 1990s. 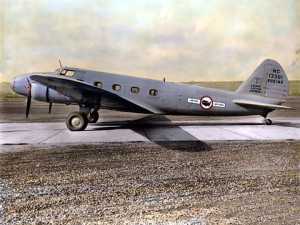 The 247s remained in airline service until World War II, when several were converted into C-73 transports and trainers. Some were still flying in the late 1960s. CF-JRQ 1699 National Museum of Science and Technology, Rockcliffe, Canada. The aircraft in the National Air and Space Museum has an interesting operational history itself. It made its first flight on September 5. 1934. It was leased from United by Roscoe Turner and modified with extra fuel tanks for the 1934 MacRobertson Race. Afterwards, the airplane was returned to United where it served in regular airline service until 1937, when it was sold to the Union Electric Company of St. Louis for use as an executive transport. In 1939 it was purchased by the Air Safety Board, which used it for fourteen years. The airplane is displayed with two sets of markings. The left side is marked as it was when flown by Colonel Turner in 1934, showing NR-257Y; the right side is marked as the aircraft was flown by United, as NC 13369.